Photos courtesy of Erin Sio. The students are so tired today, after a long, emotional parting with their students… We spent the morning in festivities celebrating both our departure as well as one last hurrah for the school’s 23rd anniversary (March 10). Each class danced, read poetry, or sang for us. We, in turn, had a few exquisite performances in their honor, not the least of which was a dance we learned from Roberto, the school’s dance teacher. It was a real crowd pleaser. Lauren dazzled the students with her quick hands and cup stacking, while the whole group performed “The Cup Song” at least as well as the one you can see on YouTube. All of this took place in the street, of course, since there is no auditorium or large space. Then, the students all returned to their classrooms, where they served sandwiches or salad, and drinks. Music, lots of notes and gifts, complete with hugs and kisses, tears and nervous smiles filled each room as I went around taking dozens of pictures. We spent a long time relaxing after lunch since it was ultra hot today. We would have yet another good-bye celebration this afternoon with the older kids. This time, though, it was inside. We watched more folk dancing, performed Roberto’s dance again (although with a different version of the song, making it a guessing game as to when to change steps….) and were so happy that Hanna sang as she played guitar. After dinner, the students went home to begin their packing over the next two days. Lots to do. Tomorrow we will go to Masaya Volcano and then off to the artisan market. A special dinner tomorrow night will top off the day. The students are doing SO WELL!! Both Sole and I keep telling each other how lucky we are that they get along so well and are able to adjust to changes in plans, highs and lows, heat and different food, new friends, new spaces and all the rest. While I personally know each student from class or tennis team, it is still a wonderful discovery for me to get to know them each so much better on this service trip. Such a good group. Parents, you must be proud of your children for doing an amazing job these past two weeks. One more day to go. Pictures and comments will be scarce tomorrow, since it will be a late night and we have to pack. I`ll try to post a little something about the volcano, however. With the home stretch behind us, we’re headed full speed to the end of our trip. The benefits of service aside, I’m definitely looking forward to getting home. Earlier today, Travis commented that it felt like the time had flown by (that we had left Drayton circle only yesterday). I can’t say I share this sentiment. This trip has been a very long alternative to spring break, and I remember living through every moment of it, whether interesting or dull. These last few days in particular were routine to a fault. This included the awkward timing of the dinner shift making dinner uncomfortably late. The only break from the final week’s doldrums was our service work and our fellow volunteers. In retrospect, I guess this could be said about the entire trip, though the satisfaction of doing service and the novelty helped smooth out the first week or so. The fatigue has begun to set in, however, and I suppose a lesson can be learned about appreciating those who dedicate their lives to service by understanding the effort their work requires. That isn’t to say the trip has been boring. To do so would be a disservice to the wonderful people we’ve met during our brief stay in D.C. and the help we’ve both given and received. Personally, the human factor is what made the trip. It is something in the nature of volunteers, a consequence of what it takes for someone to give themselves over to service: you’ll only meet the most interesting people. 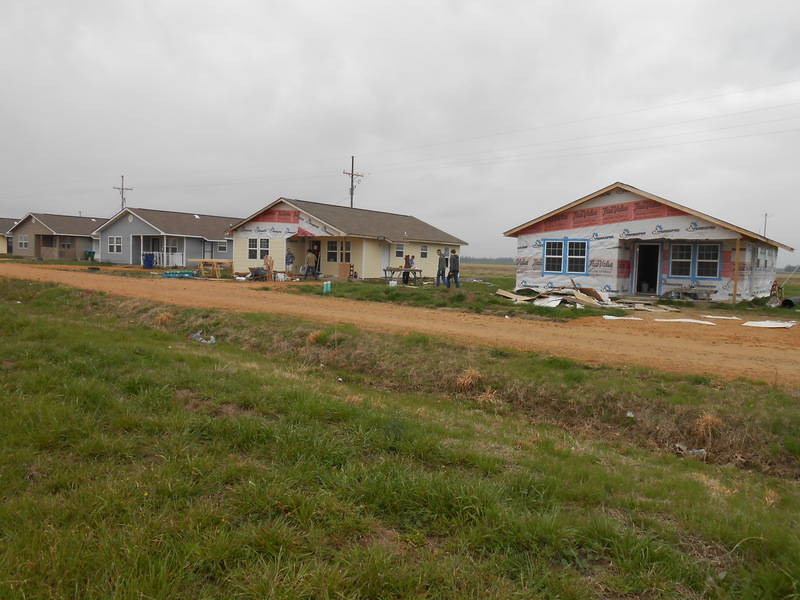 We’ve been working in Tutwiler, MS, with the West Tallahatchie Habitat for Humanity affiliate. It has been excessively cold here – on Tuesday, it was 32 degrees in the Mississippi Delta at the same time it was 31 degrees in Newtown! We are dealing with it, however. This photo shows all the houses that George School students have worked on in the past five years. Pictures from the day in our houses in Tutwiler. The kids have been painting & texturizing ceilings as well as staining and varnishing baseboards and cabinets. Messy, messy work! But they are hard at work. This is Cheri writing, mostly because the kids are exhausted! This morning we participated in one last round of “competencias” in front of the school, in the street. Today’s highlights were sitting on balloons and walking with jojotes balanced on spoons in the kids’ mouths. I was proud of our GS kids as they beat the 10 year olds…! After the competitions, it was class as usual, for the last time. Tomorrow, we spend most of the day watching and participating in performances for everyone. Then the big good-byes to the students. So, lots of winding down happening as kids are frantically writing last notes to our group, giving little gifts, and dreading the finality of our trip. After lunch, we hopped on our bus and returned to Los Quinchos, the farm for abandoned boys where we went last Saturday. Today, we had two major tasks. While five of us fetched firewood for tomorrow’s chicken dinner at Los Quinchos (bye, bye, cute chickens we saw today…), the rest of us helped dig 30 holes for citrus trees. Then we planted them, which didn’t take long at all. We left there very dirty and feeling satisfied about our quick and efficient afternoon. In two hours, we had done quite a bit. We didn’t get back until 6:30 and this time, instead of eating dinner at Rafaela’s, the upper grades held a dance party for us at the school. Quick dinner of corn tortilla, a little meat, and gallo pinto with a bit of cabbage, tomatoes, and onions. Yum. It took a long time for the dancing to get started, but once it did, lots of kids joined in. Sole and I agreed that we felt old watching them….! As if this weren’t enough action, we then walked to Hanna’s host house where her family gave her an early birthday party! A cute cake (see photo) discovered right away by the hand of Hanna’s 3 year old brother, Santiago and red or orange Fanta to complete the evening. It was a sweet gesture, with music and colored lights. We were of course tired after a long day at school and at the ranch…! Tomorrow should be interesting since we are starring in six (6!!) performances. One of them is the cup song and I had better not mess up. I was talking with Rafaela this morning about students who go to school at la Nicaraguita. There are 276 students total in the school and many of them have a hard time paying the monthly fees. There are in the neighborhood many, many children who either go to the local public school, where classes can have up to 70 kids or some simply don’t go to school. Those kids are the ones who often help out the family by selling things in the street (tortillas, soup, bottled water….). Pauline McKean and I started in 2006 an effort (called “U-Nica”) wherein people help out by sponsoring a child in any grade so that they can attend la Nicaraguita. There are now about 20 families or individuals who do this annually. They sponsor one child for the remainder of that child’s elementary and high school education at la Nicaraguita. It is very satisfying work…. This morning, while talking with Rafaela, she thought of another neighborhood boy who is in need of getting more attention at school. She invited him and his father in the office and offered him a spot in school. The father and his son’s reaction was one of surprise and relief all at once. He would start tomorrow! This boy, like all the kids in the U-Nica program will have a chance at a better education and hopefully will go on to college, like most of the U-Nica kids. It was very gratifying to see this boy, who lives with 30 of his relatives under one roof, smile even nervously while imagining how school will be different for him now. If you would like to know more about U-Nica, please write Cheri Mellor or Pauline McKean a note. We’d be happy to tell you all about it. I had an amazing morning at La Nicaraguita. After two weeks working with a group of four year olds. I have become very attached to some of the children. My favorite, by far, is a little boy called Jeremy, who looks like he came straight from the “Lilo and Stich” movie. He has a round face, large brown eyes, and wears his hair perfectly slicked back. Today he walked into class very distressed, upset that his dad had to leave. The “Prote” of my class walked Jeremy over to me, he had tears streaming down his face. Jeremy must have hugged me for five minutes. It was not until that moment that I realized how much I love these children. My heart broke holding Jeremy, and I found myself comforting him like he was family. The gracious, warm culture of “El barrio Riguero” has began to really sink in and affect my personality. It is very special. This afternoon, we returned to the place we were yesterday and we learned more about recycling.​There, they showed us how to use cardboard boxes and after cutting out a pattern, we made archive holders, where you can put magazines, folders, papers and keep them on a bookshelf. We decorated them and covered them in plastic at the end. All in the name of recycling! It’s raining this morning–our last day in Cape Town. Today we will visit our schools for any final work on projects and to say goodbye. We have a farewell dinner with host families tonight. The kids are sad about leaving. We leave for the airport very early tomorrow morning for our 7:30am flight to Johannesburg. Once there we will have a tour of Soweto and lunch at a shabeen. Afterward we will spend a few hours at the Apartheid Museum which is an intense experience. We will do some last minute shopping for souvenirs at an open market and finish the day having dinner at the home of GS alum Chinezi Chijioke. He collaborated on a school called African Leadership Academy (ALA) which provides high school education for anyone from the continent who wants to learn business, leadership, economy and entrepreneurship in addition to a traditional curriculum. Several students from ALA will join us for dinner at Chinezi’s house. Friday morning we’ll leave bright and early for Kruger National Park. Along the way we’ll visit the Blyde River Canyon which is spectacular. We’ll have a game drive on Friday night and all day Saturday in open vehicles. Let’s hope the rain stops. This morning I awoke to hot bread and orange juice waiting for me. After eating with my host mother, she walked me to Rafaela’s where I ate even more before heading off to the school. When I got there three kids had already arrived and began chanting “Kirsten”! My teacher wasn’t feeling well today so we played with clay mostly. Fifteen 3-year-olds with clay pretending each piece is a different animal and making various sounds was the highlight of my morning. Dance lessons came later, which is always a silly time. All of us putting our all into shaking what our mama’s gave us and not have very much success, but having a blast. I’m going to miss it here so much. In the afternoon the whole group travelled to another farm called Cafetal. There we were split into two groups where we learned about how coffee is made and the types of plants they have. My group worked with a man who first showed us how to recycle trash and make it useful for everyday use. We made a flower pot out of old plastic bottles and it was so cool to see how innovative we could be. After that we took a tour around the farm. We encountered an adorable little sheep while we were looking through coffee plants. We tried petting it but the sheep only liked Hansel. The forest was beautiful and the light made all the plants and flowers shine. There were even avocado plants we tried picking from, but they were too big to fit in our bag. We are going back tomorrow, so it will be easier for us to make our way around now that we are a little more familiar with the place. The bus ride home was long but relaxing. I hope tomorrow we can use what we learned today and it will be fun and helpful. Today we worked at Holy Cross, a Catholic organization that houses over 90 orphans. Sister Cheryl Ann asked us to clear an impossible garden plot with mangled wire and buried bricks. The kids put forth a resounding effort.